Last week, I posted this meme on CADnotes Facebook page. It got many reactions, comments, and shares. The reason why so many people reacted is that they know the pain of receiving drawings that are not using layers correctly. Using only Layer 0 is the worst. The number of the reactions on the page shows that misusing layers is a well-known problem. Why is using layer properly in AutoCAD is essential? Why can’t we just draw everything on Layer 0? One drawing can have many layers. And depends on the complexity of the drawing, you may have a few to dozens of layers. You can use each layer to draw a specific object type. For example, you can use Wall layer to draw walls on it. Furniture layer to draw furniture on it, and so on. AutoCAD supports tens of thousands layers in a single drawing, which is virtually unlimited. Changing active layer regularly to draw objects might seems tedious and takes longer to complete a drawing. However, you will find it very useful during the design process and the drawing presentation. When are We Using Layers? The layering system is an essential drawing management in AutoCAD, and you should use layers in every drawing. The common usage of layers is to draw objects on a layer based on their function. Create all dimensions on a specific layer. Create walls, doors, windows on separate layers, and so on. 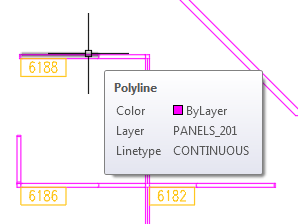 If you follow a particular CAD layering standard, you can use the standard layer names. Layers can be useful in many ways. First, because you draw objects on separate layers, it is easier for you to understand the drawing. You can quickly know an object type by checking the layer. AutoCAD drawings are just lines and arcs. Using layers can make the drawing easier to understand. Second, you don’t have to set properties for each object. You only need to set the properties for the layers. When you draw an object on a particular layer, it will have the same lineweight, color, linetype, and the other properties. It gives you a better control to plot your drawing. Third, you can hide/show or lock/unlock a layer. It means you can have greater control of your drawing. You can lock several layers to prevent they are accidentally modified. You can hide objects when the drawing becomes too complicated. Fourth, using layers adds a better control to select and modify objects. Let’s say you want to select all partition walls in your drawing and copy them to the next typical floor. AutoCAD doesn’t understand which lines are partition walls. However, we can tell AutoCAD to select lines on the Partition Wall layer. AutoCAD layer is the essential drawing management that everyone must use. Regardless the complexity of your drawing. It is not easy to work with a drawing that only has one layer. 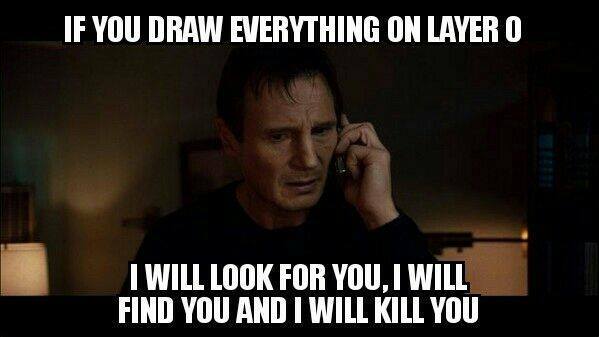 Everyone hates to receive a drawing like that. Can you imagine how people feel when they don’t have a proper control of the drawing because every object are on Layer 0? If you haven’t work with layer properly, you should start now. It will give benefit to everyone, including yourself. Thank you Edwin, very cool. Nice article on using autoCAD layers. I am learning autoCAD currently and I’ve not really understand the concept “layer”, can you give me a lay man explanation of layer? Thanks. 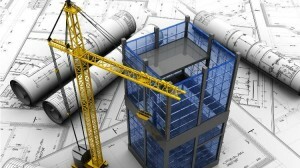 Great article on using AutoCAD layers. I’m a CAD manager at an environmental company and it is very important that we use layers on all of our drawings. We have so many different symbols and objects that we use in our drawings, if we placed everything on layer 0 we would be in trouble. Yes, that would be a nightmare!